In 1989 we had our first elk hunt, and since then we have been having a modest harvest each season - we have opted to harvest quality bulls verse quantity. During the winter of 1984 and 1985 we transplanted 150 elk into our Scoop Lake guide area. The transplant involved catching 75 elk in southeastern British Columbia the winter of 1984 and trucking them 1200 miles to Fort Nelson, then flying them 170 miles into Scoop Lake. The following winter of 1985 the same procedure, 75 elk were caught in Elk Island Park, trucked and flown to Scoop Lake. We now have a flourishing herd of elk. In 1989 we had our first elk hunt, and since then we have been having a modest harvest each season. We have opted to harvest quality bulls verse quantity. Since 1989 we have harvested bulls in the 390 class with our average elk scoring over 300 Boone and Crocket, If you are willing to turn down bulls your chances are good to see a bull in the 330 class or better. Our season is September 5th-15th. These hunts are conducted on foot starting often before sun rise. We are often hunting from the moment you leave camp. Or you may have an hour or so hike on relatively flat ground to the spot you hope to find success. 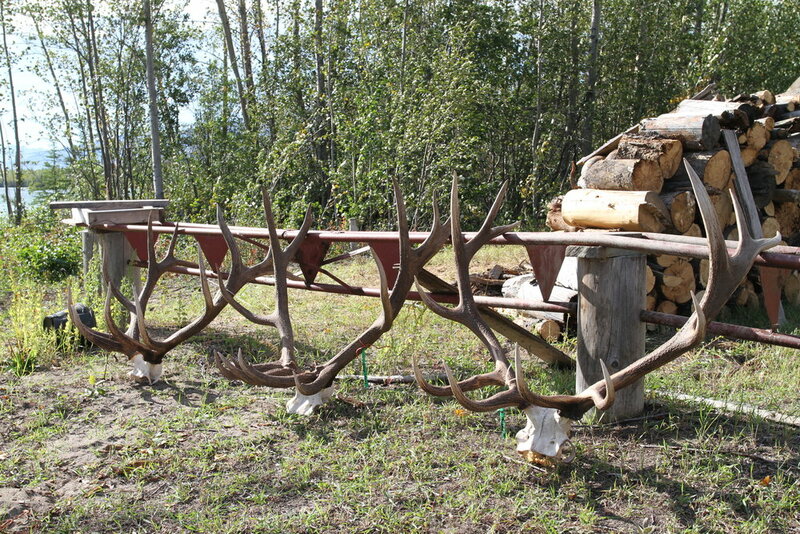 These hunts can be done from a cabin but often to get in on the bigger bulls it may involve tenting with the elk. The days are long often up before daylight back in camp for lunch and a siesta and back out for an evening hunt. The terrain is relatively flat with aspen and pine forest. We call the elk no spot and stalk. We have enjoyed very good success on good quality free range elk. You will not find any other area that produces as many good quality free range elk in BC. Our hunts are on foot, hiking from the cabin early in the morning. You are hunting the minute you leave the cabin, the guides bugle the elk, and you generally find yourself in close proximity to your bull before you see him. Imagine a 350 class bull ripping the brush apart and bugling in your face, cows scattered around, the hair standing up on your neck and you’re trying to get your sights on this monster. Hunters need to be in fairly good shape as we do quite a bit of hiking. We enjoy a very high success on very good quality elk, 90 percent of our elk score over 300 Boone and Crocket. Have a question or interested in booking a hunt? !